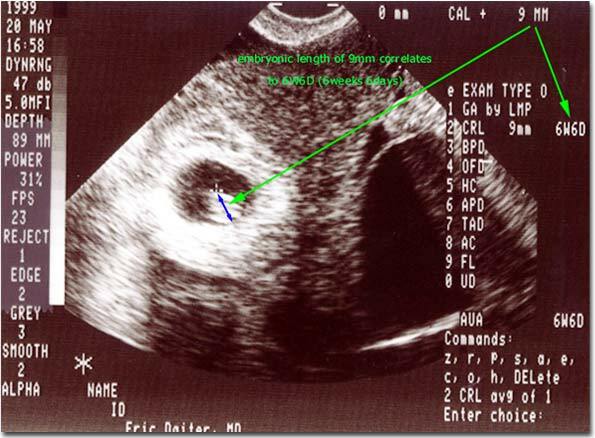 Photograph of a transvaginal ultrasound scan that reveals a single intrauterine gestational sac within the uterine cavity at 7 weeks gestational age (5 weeks after fertilization). The gestational sac is seen containing an embryo that measures about 9mm (between the “+” shaped calipers) which was seen to have an active fetal heart beat. I normally see an embryonic size of about 10mm at 7 weeks gestation and virtually always see the fetal heart beat at this gestational age (if the dates are known with certainty). The absence of a fetal heart beat at 7 weeks gestational age (with certain dates) is ominous with regard to confirming a normally growing pregnancy.